Walking or cycling through the farmland and vineyards of the Champagne region from Laon to Reims on the Via Francigena, leading you to Reims, do not forget to take some time to visit the magnificent Notre-Dame Cathedral. Reims is a city in the Champagne-Ardenne region of France, lying 130 km, east-northeast of Paris. It was founded by the Gauls and became a major city during the period of the Roman Empire. 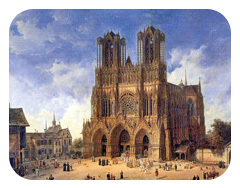 Reims played a prominent ceremonial role in French monarchical history as the traditional site of the crowning of the kings of France. The Cathedral of Reims (damaged by the Germans during the First World War but restored since) played the same role in France as Westminster Abbey has in the United Kingdom. It housed the Holy Ampulla (Sainte Ampoule) containing the Saint Chrême (chrism), allegedly brought by a white dove (the Holy Spirit) at the baptism of Clovis in 496. It was used for the anointing, the most important part of the coronation of French kings. The outstanding Notre-Dame Cathedral of Reims is now a UNESCO World Heritage Site and is known as a masterpiece of Gothic Art, the cathedral has the most number of sculptures (more than 2300).